Hortus Camdenensis | Ananas comosus (L.) Merr. Tender herbaceous perennial with a dense rosette of up to 50 leaves. 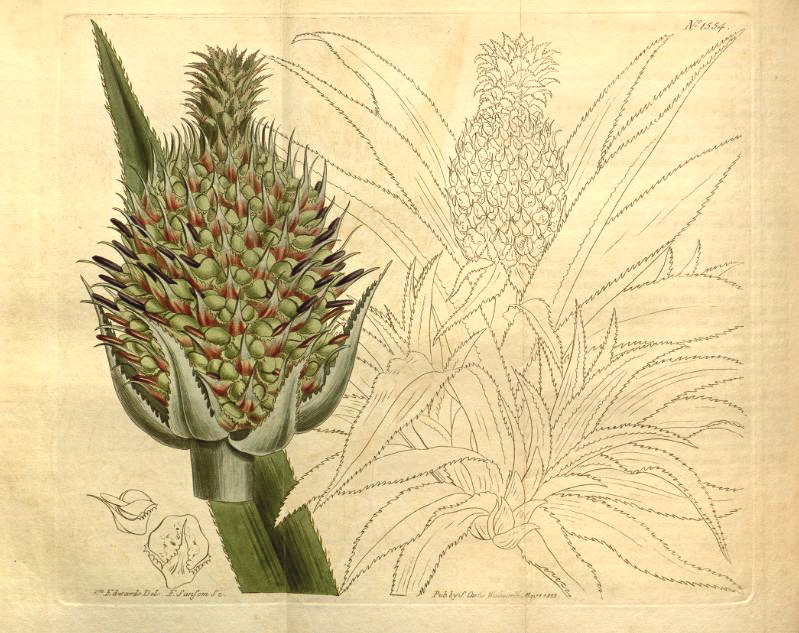 up to 1.5m long, the cone-like inflorescence becoming a swollen fruit, to 30cm long, the well known pineapple. [RHSD, Hortus]. ‘The resemblance of this fruit in form to the cones of some species of Pine Trees, has evidently suggested the English generic name. Marked as biennial in the Hortus Kewensis. Propagated by offsets, as well as by the crown of the fruit; seldom by seed in Europe, where it rarely forms any. Miller thinks, that if the seeds were frequently sown, there would be as many varieties as of Apples and Pears. He made himself some trials by sowing them, and always found them to produce varieties of the parent plant. The present variety [Queen], the flesh of which is white, is the most usual in Europe; but it is deemed inferior in its esculent qualities to the sugar-loaf sort, the flesh of which is yellow. The species is native of South America; and was introduced into England in 1690, by Lord Portland.’ [BM t.1554/1813]. Pineapples have found a number of uses other than food, particularly fibre production. ‘The pineapple was introduced into the Philippines by the Spaniards at an early date, and is now widely cultivated throughout the Archipelago. In some islands, particularly in parts of Palawan, it has become thoroughly naturalized. In the Philippines a very fine and highly prized cloth, known as piña, is made from the fibers of the pineapple leaves. The production of the fiber and the manufacture of the cloth is chiefly confined to the island of Panay, the center of the industry being the towns in the vicinity of Iloilo. When grown for fibers, pineapples are closely crowded in planting, the object being the production of long leaves. Piña cloth, either plain or embroidered, is exported in considerable quantities.’ [Brown – Philippine Fiber Plants p.48/1919]. Today translucent piña cloth is much used in the manufacture of the Barong, the formal wear of Filipino men. 1. Providence. Plant large, very spreading. Leaves very broad. Fruit very large, broad(?) or thick, pips rounded, dingy yellow with slight tinge of red. 2. Emille. Plant medium size, upright, makes suckers before fruiting. Leaves medium breadth, dark red everywhere, striated, covered on upper surface with glaucous bloom. Crown small. Fruit large, oval, slightly conical, dingy brownish yellow & red. Pips rather small, not prominent. Flesh white, juicy, not high flavoured, of moderate excellence. 3. Smooth Cayenne. Plant of rapid growth, not spreading. Few suckers medium size. Leaves narrow: nearly without prickles, outer mottled with red in centre of plant bright green without tinge or red. Fruit large, cylindrical, pale yellow, with a peculiar musky odour & high flavour but acid. Pips very regular, flat. 4. Black Antigua. Plant large, spreading. Leaves long, narrow, reddish and glaucous in centre of plant but quite green and without powder. Frost hardy the greater part of their length, not striated. 5. Black Jamaica. Plant medium size, not spreading. Leaves narrow, reddish almost everywhere, not glaucous above, not striated. 6. Moscow Queen. Plant small, spreading, makes many suckers. Leaves very strongly veined, oblique, tinged with dark red. Fruit small, frequently misshapen. Very deep yellow when ripe – dark green before, very highly perfumed & sweet. Shape, pips not prominent, irregular, obtuse, large. Crown small nearly double. 7. Ripley Queen. Very like Old Queen but fruit perhaps larger. Fruit medium size – (4lbs). Very good shape, nearly cylindrical but slightly rounded at the ends. Pips moderately prominent, pointed. Flesh deep yellow. Crown small. 8. Montserrat. Plant large not spreading. Leaves rather broad, altogether very dark red with very slight glaucescence in centre, becoming yellow when old. 10. Green Olive. Forming many suckers under. Fruit small roundish conical. Very green before ripening, pips rounded moderately prominent. 11. Prickly Leaved Cayenne. Plant large, spreading. Leaves narrow, green & slightly glaucous in centre, becoming reddish & losing glaucescence outwardly. 13. Old Queen. [Bidwill ps. 10-11].